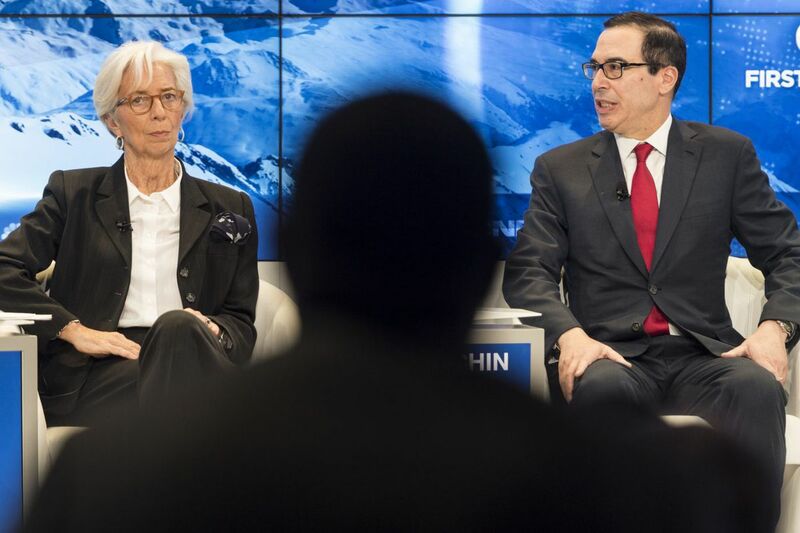 Christine Lagarde, Managing Director of the International Monetary Fund IMF (left) and Steven Mnuchin, Secretary of the Treasury of the United States, attend a panel session during the 48th Annual Meeting of the World Economic Forum in Davos, Switzerland. WASHINGTON — The Trump administration's chief spokesman for the U.S. dollar, Treasury Secretary Steven Mnuchin, has given an extra nudge to an already sliding greenback, shaking up currency markets in the process. Mnuchin's comments Wednesday at the World Economic Forum in Davos, Switzerland — that "a weaker dollar is good for trade" — helped push down the U.S. currency to a three-year low. And although Mnuchin played down his remarks Thursday, the dollar fell further against major currencies. The euro, for instance, is worth about $1.25 now, a level last reached in late 2014 and a dramatic upswing after the euro had slid to a low of about $1.03 in late 2016. Mnuchin said Thursday that his remarks were "balanced and consistent" with what he has said before, but in explicitly speaking about the dollar and trade a day earlier, he was walking a fine line between stating a truism and suggesting a currency objective. In years past, U.S. officials have often complained about other countries, especially China, for manipulating exchange rates to gain an economic advantage. After Prime Minister Shinzo Abe took power in 2012 and talked down the yen in a bid to help Japan's export firms, many viewed the jawboning as impolitic and a risk to sparking competitive devaluation and volatility in markets. Mnuchin's statement may have had all the more ring of policy because of the Trump administration's assertive "America First" goal of reducing the approximately $500 billion annual U.S. trade deficit. Earlier this week, the administration slapped hefty tariffs on solar panels from China and washing machines from South Korea, and President Trump is seeking to revamp trade deals with Canada and Mexico as well as South Korea. While a strong dollar is conventionally viewed as good for the American economy, a weaker currency can help exporters as goods are comparatively cheaper in foreign markets, and it also boosts the bottom line of U.S. multinationals when their sales in local currencies are converted to dollars. At the same time, a declining dollar means imports and commodities like oil, which are priced in dollars, will cost more for U.S. consumers. And American travelers to foreign countries may be in for a bit of sticker shock. The British pound on Thursday was fetching about $1.43, up from a little more than $1.20 a year ago. In mid-2015, a dollar was worth 125 Japanese yen; that fell to less than 109 yen. Other currencies including the Swiss franc and the Canadian dollar also were appreciating sharply against the dollar this week. To be sure, the dollar had been weakening well before Mnuchin's remarks, but his comments in Davos reinforced the Trump administration's trade-protectionism sentiments that have been hanging over the dollar. In the last month, the dollar has fallen about 3 percent against other major currencies, after adjusting for the size of trade with the U.S. The dollar started to rise in mid-2014 and kept climbing until about a year ago, reflecting the nation's relatively healthier economy and monetary policies. Economists say the dollar still has some room to slide further, but experts and investors have been caught off guard by the relatively rapid drop recently, particularly this week. "What I'm inferring from this is that political posturing is weighing on the dollar," said James Orlando, a senior economist at TD Bank in Toronto. "The fundamental value of the dollar is lower than where we are," he said. "But forcing it down arbitrarily isn't good policy. … This sort of action isn't what we're looking for — and we're hoping it will ease."